P18.5M construction/extension of flood control structure along Mapula river protecting Mapula bridge and Biliran circum road, Biliran, Biliran Province is 100% completed as of July 31, 2018. This project is in contract with YOYEN Enterprises. The completed project will prevent flooding on the said area protecting not only the bridge but the surrounding agricultural lands. NAVAL, Biliran – Following the department’s new approved plans and specifications for flood mitigation structures, District Engineer David P. Adongay Jr. assures quality implementation for completed flood control projects in Biliran. 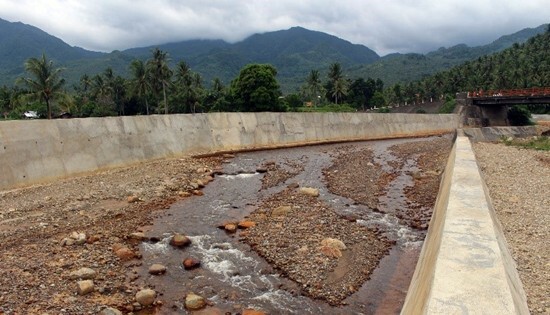 The Department of Public Works and Highways (DPWH) Biliran District Engineering Office (BDEO) has a total of 18 flood control projects this year amounting to P371.5M under the Flood Management Program. Out of the 18 flood control projects, the district office has completed 13 and eyeing for the completion of 5 more for the next two months. According to Adongay, the previous design of flood control is no longer the same as the design of the district office at present. “We have already an additional reinforcing bars on the revetment side designed to protect from flooding,” said Adongay. Recalling tropical storm Urduja last year that badly hit almost the entire province, Adongay said that district’s new design of flood control projects have withstand against major flooding. “Based on our experience, yung mga bagong design hindi nasira nung Urdjua, pero depende rin sa river at lugar kasi merong lugar na binaha pero walang kasamang debris,” Adongay explained. Adongay further added that the goal of these flood control projects is to ensure safe environment through these facilities, leading economic growth towards poverty reduction. “As regards the completed flood control projects in the province, these are important infrastructure projects to the populace and community as their lives and properties are protected against major floods,” said Adongay. The completed flood control projects are located along the rivers of Bagongbong in Almeria, Busali and Santol in the Municipality of Biliran, Esperanza in Cabucgayan, Mainit, Mapula and Kaulangohan in Caibiran, Bool in Culaba, Madao, Tucdao and Ungali in Kawayan, Banlas in Maripipi, and Anas in Naval, the capital town.